Posted under Health Guides. Updated 13 September 2017. Scoliosis can run in families, but most often the cause is unknown. Ask your scoliosis doctor if you need treatment. Most teens with scoliosis can participate in sports and other physical activities. Scoliosis means that your spine, or “backbone,” is curved. Most people with curved spines also have rotated spines. There are different types of scoliosis and different reasons that might cause your spine to curve. The most common type of scoliosis is called idiopathic scoliosis which means there is no known cause, but it can run in families. There are also other less common types of scoliosis. Sometimes, the spine appears to be curved because of a difference in leg length. Rarely, some babies are born with spinal defects that cause the spine to grow unevenly. This last type of scoliosis is called congenital or early onset scoliosis. Anyone can get scoliosis. But the most common type of scoliosis, idiopathic scoliosis, usually occurs after age 10. Girls are more likely to develop idiopathic scoliosis than boys. Scoliosis screening may be available at your school or at your primary care provider’s office. Girls should be screened particularly when they are 10 and 12, while boys should be screened between 13 and 14. If you are late going through puberty, you should be checked by your primary care provider during the teen years until you’ve finished growing. It’s especially important to be checked regularly if you have a parent, sister, or brother with scoliosis. Physical Examination: Your health care provider (HCP) will look at your back, chest, hips, legs, feet, and skin then check to see if your shoulders are even, whether your head is centered over your shoulders, and whether opposite sides of your body look even. Next your HCP will also examine your back muscles, while you are bending forward, to see if one side of your rib cage is higher than the other. If there is a significant asymmetry (a big difference between opposite sides of your body), your HCP may order an x-ray or have you see an orthopedic spine specialist (a provider who has experience treating people with scoliosis). X-ray evaluation: If you have a medium or large spinal curve, unusual back pain, or you still have a lot of growing to do, your HCP will arrange for you to have an X-ray. You will be asked to stand facing the X-ray machine. An X-ray is a detailed picture of your spine. Your HCP will be able to see any curves in your spine and can figure out if they need to be watched or treated. Curve measurement: Measurements are taken of the curve and the angle on the X-ray image. Curves that are greater than 20 degrees may need treatment. Depending on the location, degree (severity) of the curves, and how much more growing your body is likely to do, your HCP will recommend observation, bracing, or surgery. Observation: Some curves get worse as your body grows, others don’t change, and some may even get better. Some curves require no treatment. However, your HCP will want to watch your curve carefully to make sure that it doesn’t get worse. Bracing: If your curve is large enough and you are still growing, your doctor may recommend a brace. The scoliosis brace is designed for your body. It holds your spine in a straighter position, and it helps prevent your curve from getting worse while you’re growing. A brace will usually not make your spine straight, but it can help improve the curve or prevent it from getting worse. Your scoliosis doctor will tell you how to put on your brace, when to wear it, and how long to wear it. The brace needs to be worn for the full number of hours prescribed by your doctor until you finish growing. Generally, braces can be removed for activities such as showering, swimming, and sports. The braces are made of firm plastic and fit closely over the hips. Almost all braces can be hidden beneath clothing, and you can continue to do all physical activities you enjoy. Surgery: Bracing does not work for everyone and every curve. If you have a very large curve or one that does not stop getting worse with a brace, your HCP will probably recommend surgery. There are different types of surgery. Some may be better for your specific curve than other types. The main purpose of scoliosis surgery is to fuse (join together) the bones of your curve. The fusion keeps your spine straight. Your surgeon will talk to you about your options, the different types of surgery, and the different types of implants available. Implants are devices that are inserted during surgery. They remain in your back after surgery and help keep your spine straight. What type of surgery will work best for me? What implants will be used? How straight will my spine be after surgery? What are the benefits to getting this type of surgery? What is the scar like? When can I start being as active as I was before surgery? What permanent restrictions are there on activity? Can I talk to another patient who had the surgery? What will happen if I ignore my scoliosis? After you have been diagnosed with scoliosis, you may not think that treatment is that important. However, it is very important to treat scoliosis since spinal curves can become worse and cause physical changes to your spine. 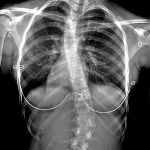 In the worst cases, scoliosis can cause changes in your chest and lungs, and later, difficulty breathing. It’s also important to treat scoliosis early because treatment is much more successful before curves become severe. How do I cope with having scoliosis? If you’re diagnosed with scoliosis, you can still live a healthy and active life. Most teens with scoliosis are able to exercise, take part in sports and physical activities, drive, and be involved in friendships and relationships. Teens with scoliosis can do pretty much everything that teens without scoliosis can do! It’s also important to remember that if you’re diagnosed with scoliosis, it’s not your fault. Nothing you did caused the scoliosis, and there is nothing you could have done to prevent it. If you have scoliosis, the important thing is for you and your health care provider to choose and follow the best treatment plan for you.